The only traditional farmhouse Red Leicester made in Leicestershire. Complex mellow flavour with nutty, fruity tones. Instructions for useServe at room temperature. These summary details have been prepared for information purposes only. While we have taken care in preparing this summary and believe it is accurate, it is not a substitute for reading the product packaging and label prior to use. Paxton & Whitfield is unable to accept liability for any incorrect information. If you require specific advice, please contact our mail order team on 01451 823460 or email sales@paxtonandwhitfield.co.uk. 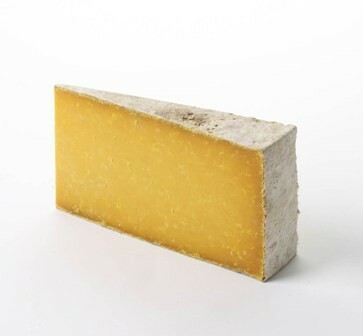 Sparkenhoe is being made on a Leicestershire farm, something that has not happened since 1956, therefore this cheese is the ONLY Leicester to be made on a farm with raw milk in Leicestershire. Leicester cheese was made on Sparkenhoe Farm by Mr George Chapman in 1745. He was quoted by Robert Bakewell, a famous breeder of the time, to have had ‘one of the best herds of longhorns known anywhere’. These included his prize winning bulls ‘Old Sparkenhoe’ and the ‘Earl of Upton.’ The Chapmans ceased cheese production in 1875 due to the fact there was no money to be made from cheese production. The last time Leicester cheese was made on a farm in Leicestershire was in the 1950s by a Mr Shepherd of Bagworth. He was a dairy farmer and was said to have made the finest Red Leicester Cheese and supplied all the local butchers and cheese shops. Over 50 years on, this age old art has been revived by Leicestershire Handmade Cheese Company making the aptly named ‘Sparkenhoe’ Leicester. Leicestershire Handmade Cheese Company is located in Upton, a small hamlet in the South West Leicestershire countryside on a working dairy farm called Sparkenhoe Farm. David and Jo Clarke are dairy farmers whose families have farmed in the area for generations. David manages the 150 head of pedigree Holstein Friesian cows and the 160 followers. The cows are fed on the farm's lush pastures and calving takes place all year round to keep the milk supply as consistent as possible. David and Jo started making ‘Sparkenhoe’ in November 2005 and use the milk produced from their own cows. The milk from the previous day's milking is pumped across from the parlour to the cheese room at 4 am. An old recipe discovered by Jo and David is then followed and traditional animal rennet added. Annatto, a natural plant dye obtained from a South American bush is added to give the cheese its rich orange colour. The curds and whey are then scalded gently and separated and the curds are cut into blocks and turned to release further whey. They are then put through the mill and salt is added. The cheese is put into moulds and pressed for 24 hours, then turned and pressed for a further 24 hours. The cheeses are bound in cloth and lard and matured for 6 months in the store at 10 degrees. The cheese are a traditional shape and size, weighing approximately 10kg and being wide but not particularly deep. They are bound and matured in cloth and lard and the flavour of the cheese is nutty and complex, with deep caramel and liquorice undertones which completely set this cheese apart from generic Red Leicester as can be found commonly in the supermarkets. Sparkenhoe is an old Leicestershire name meaning gorsey nob. It was the name given to the old medieval one hundred area and as the farm is situated in the middle of this area it was named Sparkenhoe Farm.